Police say 37-year-old Mark Fitzgerald and 65-year-old Richard Kamrowski are a minor crash turned into a fit of road rage. Fitzgerald, of Lynn, is charged with assault with a dangerous weapon and other violations. Kamrowski, of Framingham, was charged with disorderly conduct. Exclusive video shows an SUV driving a significant distance on the Massachusetts Turnpike with a man on the hood. An apparent road rage incident took place on the westbound side of Interstate 90 near the exchange with Interstate 95 in Weston. State police say two vehicles had been involved in a minor sideswipe in that town. After a verbal altercation, police say 65-year-old Richard Kamrowski of Framingham jumped onto a white Inifiniti SUV being driven by 37-year-old Mark Fitzgerald of Lynn. Police say Fitzgerald drove "a very significant distance" with Kamrowski on the hood, slowing and accelerating when he would not get off of the vehicle. The SUV reached speeds of 70 mph during the incident. "I thought he was going to run over me," Kamrowski told NBC10 Boston. "I don't think he stopped, he kept going fast, slow, fast, slow, to get me to slide off." Video from the scene showed that the SUV's windshield had been cracked. Fitzgerald appeared to run the windshield wipers with Kamrowski on the hood in the footage. Authorities say good Samaritans intervened. A man could be seen on video pointing a gun at the SUV. When officers arrived, they were initially seen pointing a gun at that armed person. Fitzgerald was arrested and charged with assault with a dangerous weapon, negligent operation and leaving the scene of a crash causing property damage. Kamrowski was also arrested and charged with disorderly conduct. "I was assaulted. That's it," Kamrowski told NBC10 Boston. "I just kept telling him, 'Stop the car, stop the car,' and he wouldn't stop." 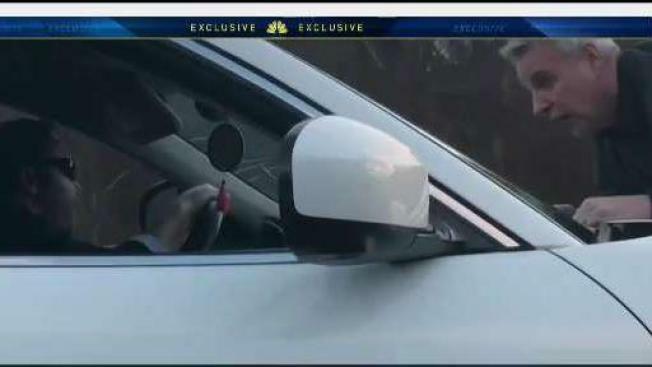 Fitzgerald refused to speak with NBC10 Boston Friday, running away from our camera and into a vehicle, slamming the door behind him. Kamrowski said Fitzgerald sideswiped him, and that he ended up on the hood during the altercation that ensued. "I felt that he bumped me, and I kind of, you know, was pushed up," he said. Kamrowski said he was grateful that the man with the gun came, as well as officers. Anyone with information is asked to call Massachusetts State Police.